Listeners do love their pastors and they agree with the sermon content they hear,’ Lori Carrell once explained to a group of pastors, ‘but most sermons don’t ask for change, and most listeners don’t experience spiritual growth as a result of the sermon.’ A participant responded: ‘Let’s get practical. I want my preaching to make a difference. What changes are worth making, and how do I make them?’ In Preaching that Matters, Lori Carrell shares answers to that question, drawing on the experiences of thousands of people—preachers and their listeners—whose effort she has studied over many years. In each chapter of this book, she offers research revelations about high impact preaching that will encourage and challenge readers to continue to grow as preachers. She then links these principles with Reflective Practice Challenges (RPCs), exercises that honor the rich experiences of pastors while opening opportunities for self-analysis, spiritual introspection, conversation with a trusted other, or implementation of research-based preaching recommendations. 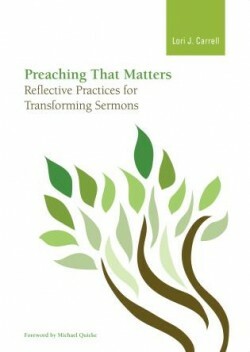 The activities have been used by hundreds of other pastors, and each RPC has been carefully selected for its demonstrated contribution to the process of transforming sermon communication. As a communication expert, Carrell approaches preaching from a ‘sermon communication’ paradigm. She begins with the task of identifying the spiritually transformative purpose of the sermon and then explores exegeting, organizing, deepening, and delivering the sermon, as well as listening to the listeners and planning for continued transformation. Her own goal is simple: to inspire and equip clergy to make changes that will enhance the transformative power of their preaching.